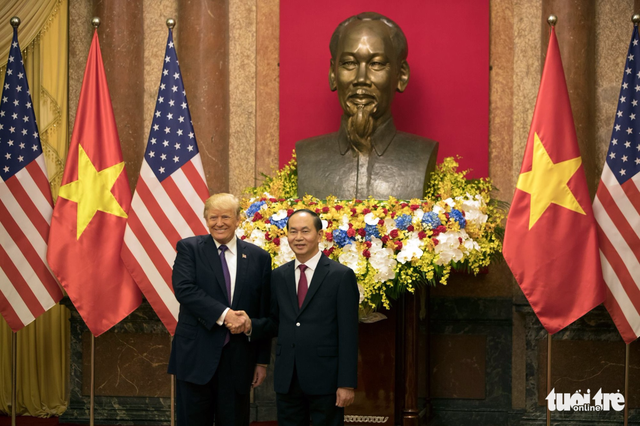 US President Donald Trump told his Vietnamese counterpart Sunday he is ready to help resolve the dispute in the resource-rich East Vietnam Sea, which Beijing claims most of. Trump's comments come ahead of a state visit on Sunday afternoon by Chinese President Xi Jinping who will meet with top Vietnamese leaders. Talks will also focus on promoting trade between the two countries, though Vietnam's gaping trade surplus with the United States, worth $32 billion in 2016, could be a sticking point. In August, foreign ministers of Southeast Asia and China adopted a negotiating framework for a code of conduct in the East Vietnam Sea, a move they hailed as progress but one seen by critics as a tactic to buy Beijing time to consolidate its power. The framework seeks to advance a 2002 Declaration of Conduct (DOC) of Parties in the East Vietnam Sea, which has mostly been ignored by China, which has built seven man-made islands there, three of them equipped with runways, surface-to-air missiles and radars. The framework will be endorsed by China and members of the Association of Southeast Asian Nations (ASEAN) at a summit in Manila on Monday, a diplomat from one of the regional bloc’s countries said. Relations between Vietnam and the United States have blossomed in the decades since their war ended in 1975. A recent survey put the favorability of the United States at 84 percent among Vietnamese. But Vietnam’s trade surplus remains an irritant for the Trump administration. At $32 billion last year, it was the sixth largest with the United States, though less than a tenth the size of China‘s. “We want to get that straightened out very quickly,” Trump said at a meeting with Prime Minister Nguyen Xuan Phuc.